The new Apple TV introduces some neat new voice control features, but Apple also believes its new living room box will sit proudly alongside your Xbox One or PS4. The App Store will offer a number of family-friendly games including Guitar Hero, Crossy Road and Disney Infinity. Like the Wii, games can be controlled via either the controller's touchpad or its Wii-like motion controls, thanks to the inbuilt accelerometers and gyroscope. 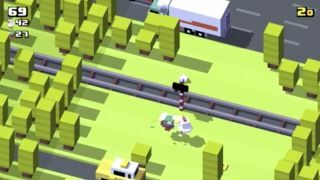 The version of Crossy Road is an exclusive version that offers a multiplayer mode - yes, you can now play with friends. It's those motion controls we're most interested in, though. Nintendo proved how well they could work, especially with more casual games. It might be a few years late, but it seems that's exactly what Apple is aiming for with its new TV. It even has a strap, you guys. A STRAP.